1. Combine water, honey, vinegar, figs, jam and cloves. 2. Sauté shallots in olive oil until soft. 3. Add honey-fig mixture. Bring to simmer; add herbs and cook for a few minutes. Season with salt and pepper to taste. 4. Mixture can be puréed till smooth or left ‘rustic’. 5. 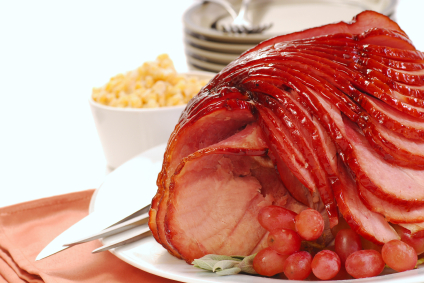 Spoon warm glaze over ham and basting every 15 minutes. Remaining glaze can be reduced by simmering and served as a delicious sauce.